I make mistakes sometimes while we are travelling. There are a lot of details to attend to, and sometimes I mess up. 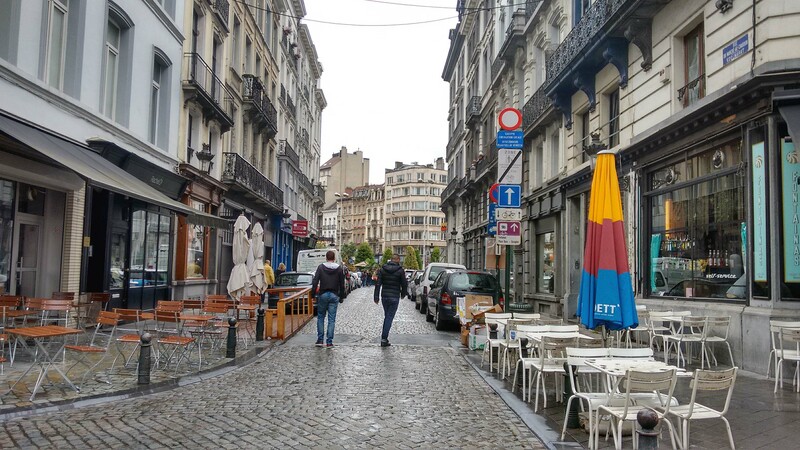 Our visit to Brussels over the Canada Day weekend was less about taking a weekend jaunt there, and more about how I misaligned our longer-term rental dates and had to figure out a way to deal with that. So, we went to Belgium for a weekend. One of the first things that we do when we get to a new country is get a SIM card with data so we can navigate our way around and communicate. Some countries (like Portugal) make this easy for us – and we are grateful. Belgium proved to be on the side of “difficult internet”. Marcus spent two hours in the airport trying to get this to work (while I sat with tired, cranky kids and our luggage). Fortunately, we were near a fry vendor. 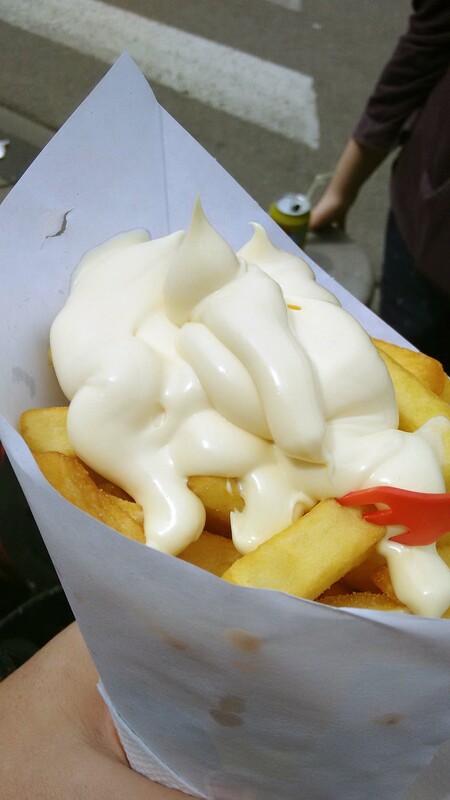 That gooey white stuff is mayonnaise (and it was heavenly). Within two and a half hours we made our way to our hotel (by bus, then by taxi) and I was ready to declare our weekend in Brussels to be the biggest mistake I had ever made. I was completely defeated. Nothing was going well… everything was a struggle. Fortunately though, things started to turn around as we checked into our hotel. We had understood that we were in a “Family” room, with a king sized bed and two twins. We actually were in two adjoining rooms, with super comfy beds. One bathroom had a shower and the other bathroom had a tub. We couldn’t have asked for a better room set up. AND we realized that the airport that we were to fly out from on Sunday, was the one that is an eight minute drive from the hotel. For dinner that night, we made our way down the street to a cafeteria (think of a cross between an IKEA cafeteria and Movenpicks), called “Lunch Garden”. 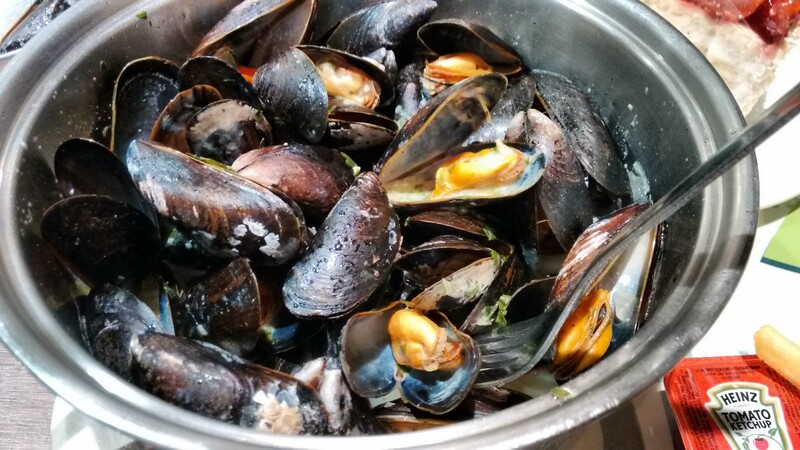 We filled our hungry bellies with wonderful food (including all you can eat mussels and fries), for less than any of our meals in Portugal cost us. After a brutal travel day, we slept well that night in our comfy beds. The week leading up to Canada Day had me feeling very, very homesick as I watched patriotic images, quotes and videos fill my facebook feed. When we woke up to rain on Canada Day morning, there was a huge part of me that wanted to be back home. 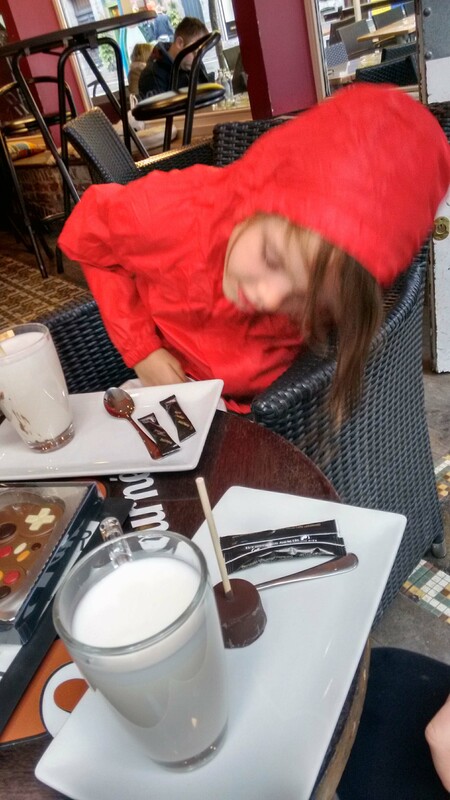 But, we were in Brussels so we donned our rain jackets and headed out to see what the city had to offer. Our first stop was downtown to visit the famous little “peeing” boy statue called the “Manneken Pis”. As we rounded the corner, I could tell from Marcus’s reaction that we were about to see something special. The Manneken Pis was dressed up, in the Team Canada uniform… in honour of our country’s 150th Birthday. I’m not sure that there could have been a more perfect place for our travelling family to have found themselves on our countries 150th Birthday, than in front of that statue. Our homesickness disappeared and was replaced by loving pride for Canada. 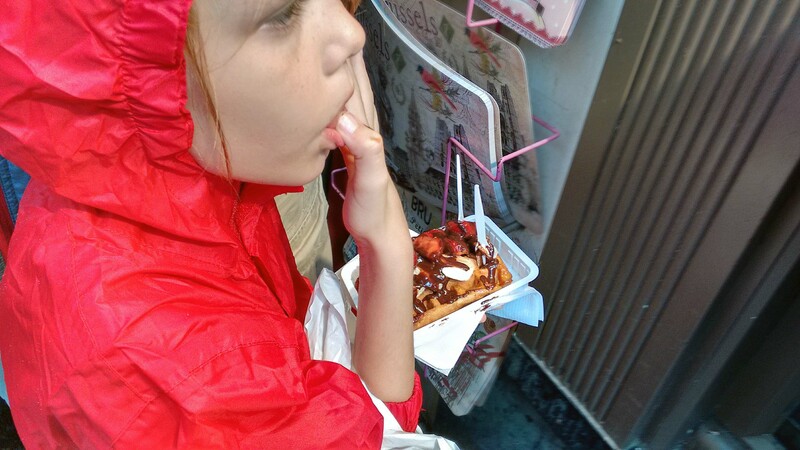 The rest of our blissful afternoon was spent doing things like eating waffles. Drinking coffee and hot chocolate (real, honest to goodness hot chocolate – where you stir a block of chocolate into hot milk) in a cafe. We ordered the kids seconds of these (and they asked for thirds…). And just wandering around looking at the beautiful buildings. And of course… buying chocolate. While we were in Brussels, just down the street from the NATO Headquarters, we also hit the milestone of 10 months of travel. The world has changed a lot since we boarded an airplane in Toronto last August, and we have changed too. One thing that has not changed though, is our belief that who our country is in the world, matters. Who we choose to be as individual Canadians, and as a country as a whole matters. A few years ago, Morgan got sent to school on Terry Fox Day without bringing in a toonie ($2) donation. It was a horrible day for her… kids picked on her in the classroom accusing her of being selfish and not caring about others. As she walked the route, girls from her class walked behind her taunting her and saying terrible things to her the whole time. I was nauseous to the point of vomiting that night when I got back from my meeting in Toronto and heard what had happened to her… She said that never wanted to go back to school again. This is not what Terry Fox would have wanted. He would not want to see a child bullied and punished for not bringing in a donation. Terry Fox is a hero because he saw that he could do something to make a difference for others, and even though it wasn’t easy for him – he went out and did it. As Canadians, we love that about him. It reflects the very best part of ourselves… as individuals and as a nation. I didn’t know what to do at that point… but I knew that I had to do something. I can’t tell you how many times in the years since that day, my kids have stopped me because they have seen someone who has needed help, and they knew we could help, both in North America and since we have been travelling. While we were walking through the crowded streets of Brussels, Artie yelled at the top of his lungs at me “J****! Mom – you just walked by a family who needs help like they weren’t even there! What is wrong with you?” So, we stopped. We turned around. We did what we could to help. Love this strory! I can relate to screwing up plans…even on a short jaunt! For the next few days we toured the area where my ancestors had lived and when we left my cousin admitted that we had arrived a day earlier than I told them we would be arriving! Gracious hosts thet they were, they hadn’t wanted to let on! Continue your adventuring safely and in good health! It is so easy to slip up with dates - and yes... one day can make a huge difference can't it?